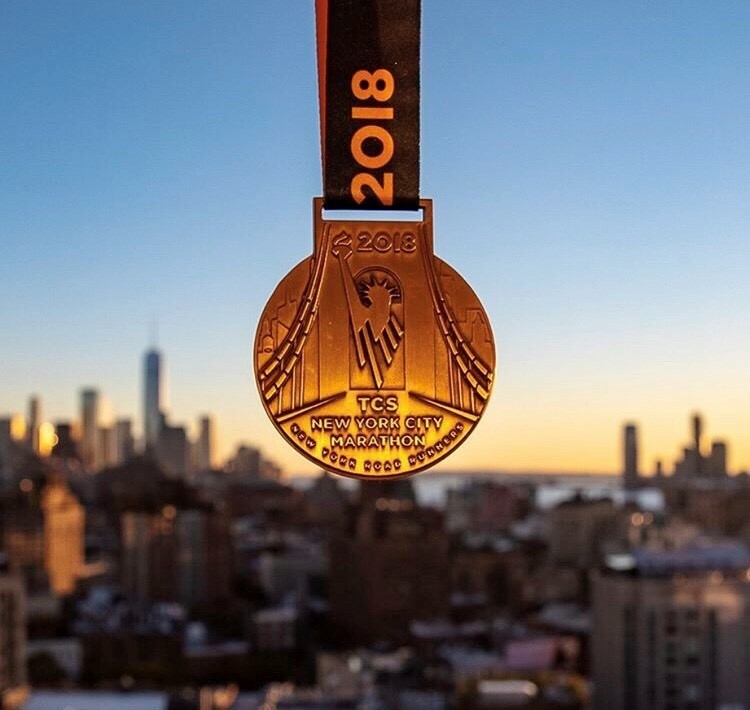 The New York City Marathon of 2018 was a very enjoyable experience for me. Weather was perfect for a marathon. The course was undulating and hence not boring. After I got my entry confirmation in February 2018, I commenced training diligently for this race. However in August I was laid low by a severe attack of dengue and unable to train for an entire month. This was a huge setback resulting in immense loss of fitness, stamina and speed. It also caused a major gap in my training. Following this setback, chasing any great timing at the New York City Marathon was no longer my goal. I decided to just run and enjoy the marathon without a target. I finished in 3:24:12 hours. I enjoyed the run as I was under no pressure to complete within a set time. Dengue had affected my joints. I am still coping with some remnant joint pain. Had I not suffered a hamstring injury due to sacroiliac joint weakness, I would have enjoyed the race even more. This event has incredible crowd and spectator support. The volunteers, security and the NYPD go out of their way to assist runners. It’s a glorious experience. The energy in the race is electrifying and encouraging. It’s not important for me to run all the marathon majors. I had wanted to run NYC Marathon ever since I heard that it was a challenging course. I started running in November 2015. I have since enjoyed running the 2016 Bank of America Chicago Marathon, Tata Mumbai Marathon of 2017 and 2018, the 2017 Comrades, Airtel Delhi Half Marathon of 2016 and 2017, Tata Steel Kolkata of 2016 and 2017, 2018 Garhwal Run (Dehradun to Dhanaulti / qualifier for La Ultra), 100k World Championship 2018 and 2018 Changan Ford Ultra 50k. At present, my focus is rest and recovery. I would like to improve my strength and joint health, flexibility and mobility. I am looking forward to 2019 Boston, which will hopefully be a race where I can aspire to improve my timing. I ran the Changan Ford Ultra Challenge 50, less than 10 days before NYC Marathon. It was an extremely challenging hilly course, in hot humid weather. It was hard and took all of me to complete. I clocked a time of 4:22:22 hours, ranking 35 out of 115 men and women. I was pleased with the result. I participated in this event since the NYC race was not by then a race for me to achieve any goal at. In September 2018, I participated in the 100k World Championship in Croatia, clocking a time of 9:40 hours. It was an extremely hard race for me since I had barely recovered from dengue and hadn’t trained well for it. Hence, the result was disappointing but it was a memorable experience. 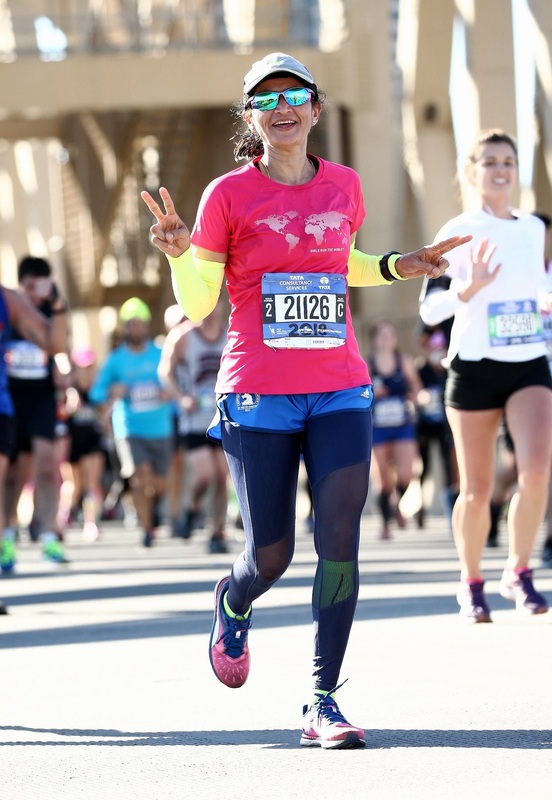 I learnt a lot and it was wonderful pushing my limits and evolving as a runner. 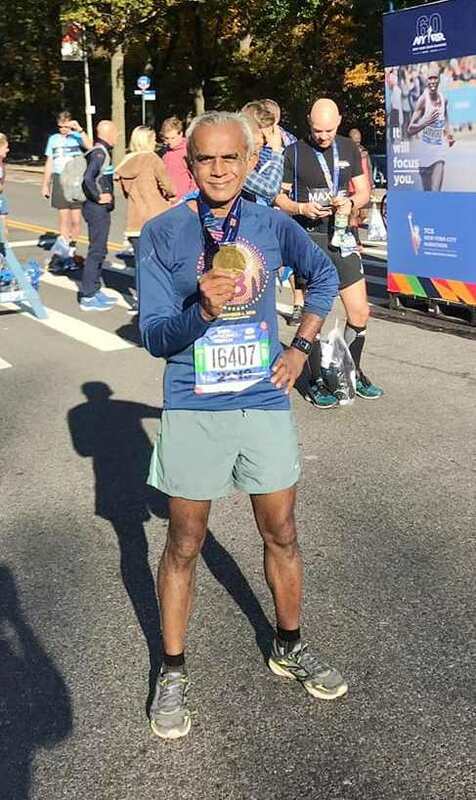 For the first time in my world majors so far, I was pacing a friend – Deeptha Raghunath – for a sub-four hour finish at the New York City Marathon. It was a stress free run for me. Weather was perfect. The course was indeed a tough one compared to the other world majors but I had trained on hilly terrain specifically for this. So the race went as per our expectations. My target was a sub-four hour finish and I managed to finish the run in 3:55:38 hours. This run was part of my plan to finish the six world majors by April 2019. I have now successfully completed five world majors and will head for my last world major from the list – London Marathon, in April 2019. I have completed five world majors so far – Berlin, Tokyo, Chicago, Boston and New York. 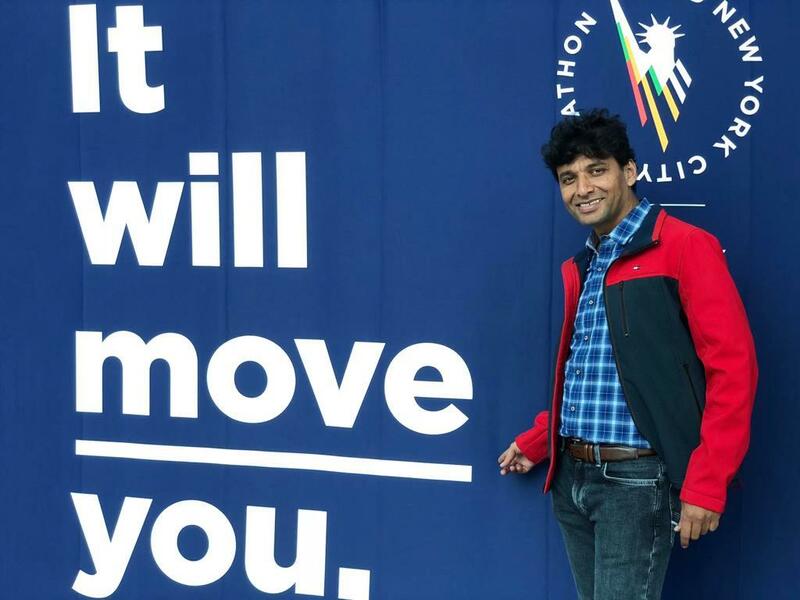 Going ahead, I will be doing IDBI Delhi Marathon in February 2019 and London Marathon in April 2019. 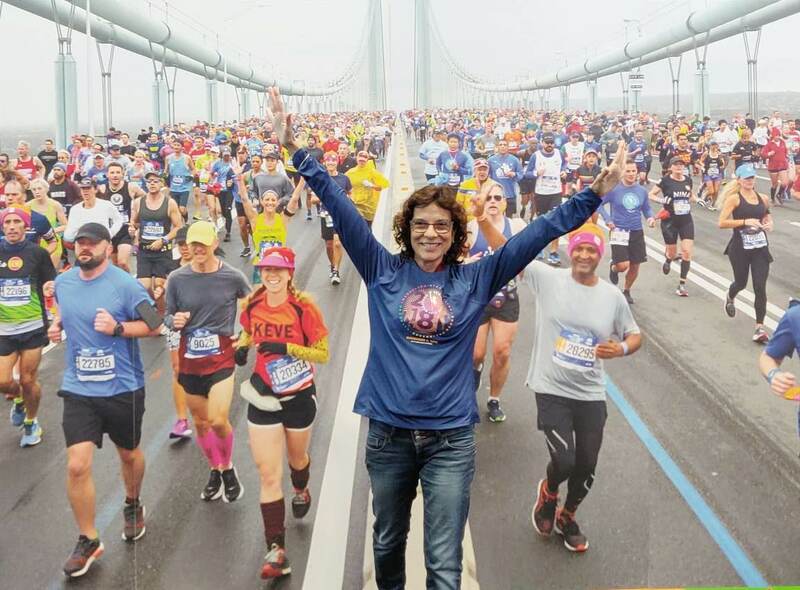 I had a great time traveling to New York and running the marathon. New York City Marathon was a difficult race with quite a lot of uphill sections as there are many bridges along the way. There was some shortfall in my training as I lost four weeks due to injuries – stiff back and tight abductor muscles. On the day of the race, we had to leave at 5:30 AM. My corral was starting at 11 AM. When we landed in the holding area it was cold and then it started to get warm. So I got out of my track-pants. But closer to the race start, the temperature started to drop. I got back into my track-pants and I ended up running the marathon in them. It wasn’t easy doing so. After 28 kilometers I resorted to walk-run. In fact, I walked quite a lot. This was the first time ever that I walked during a marathon. Overall, the experience was great. I finished in 4:29:48 hours. My coach was happy with my performance. Three factors that did not go well for me was the shortfall in my training, the five-hour wait at the holding area that took a toll on me and my running attire. NYC Marathon is a very well organized run with superb cheering. Now, I will be doing a couple of half marathons. I plan to follow it up with a 2 kilometer-swim. 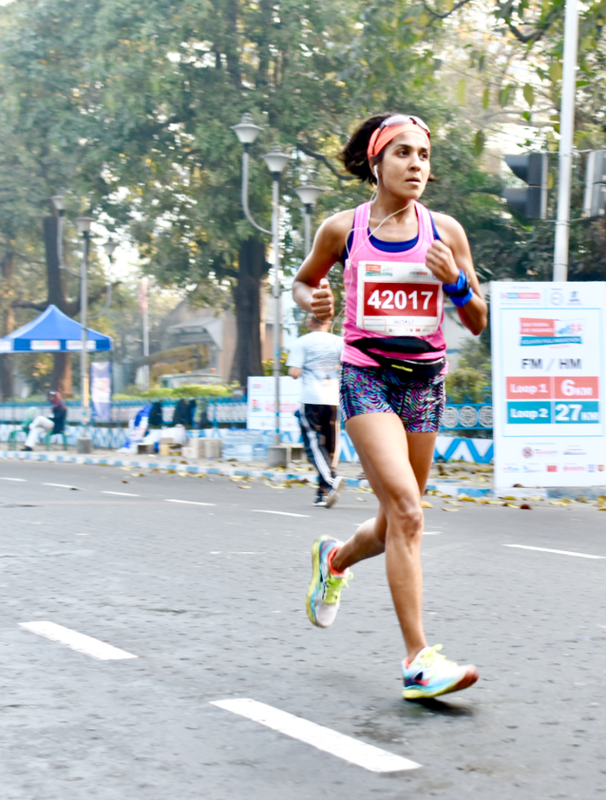 I was in real good shape during the Airtel Delhi Half Marathon held on October 21, 2018. But soon after the event I started to feel discomfort on the outside of my right knee. When I tried to bend my knee I felt pain. I rested for two days and then went for a 20 kilometer-run. At the end of that training run my knee felt locked and it swelled up. I did some icing but to no avail. I visited the doctor. It was initially diagnosed as an ACL (Anterior Cruciate Ligament) injury. Once I was back from New York I did a MRI and the problem was diagnosed as meniscus tear. I wanted to cancel my trip to New York. I tried to cancel my tickets but realized that I was going to lose a huge amount of money. 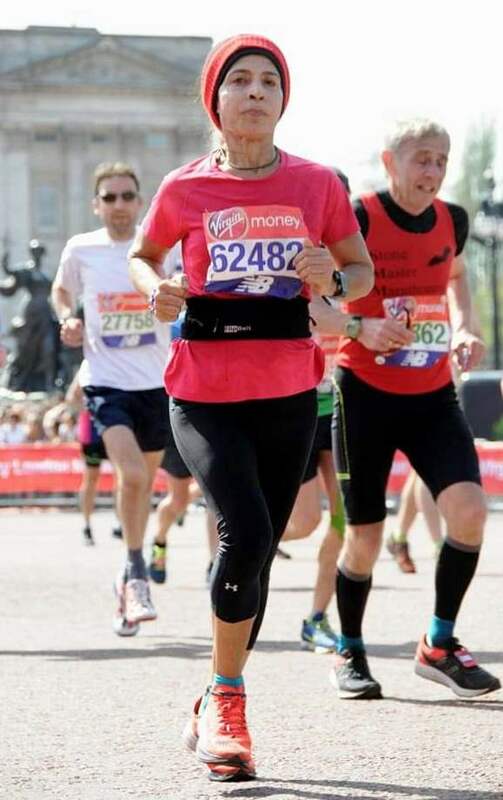 I then, decided to go and see if I can manage to run the marathon. Also, the pain had eased a bit. 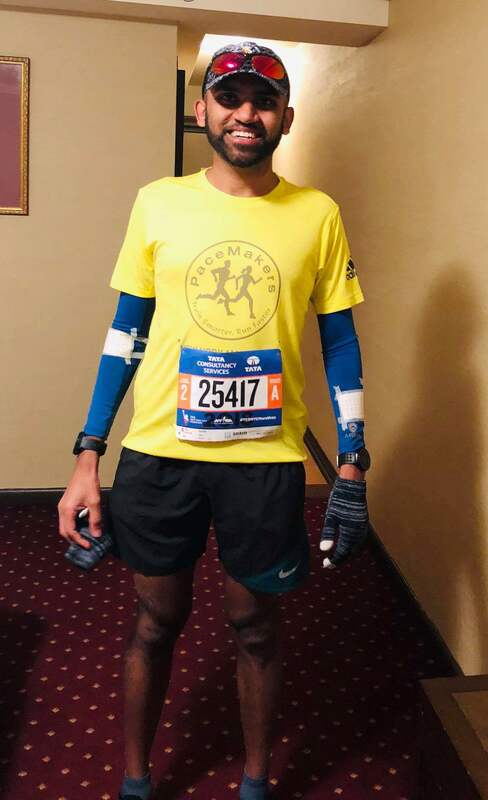 Upon reaching the US, I stayed with a friend Manjunath Bhat, who lived 78 miles away from the start line of the race. On the day of the New York City Marathon, we headed out at 3 AM. The start of the race was at Staten Island and the finish, at Central Park. Weather on the day of the run was quite good with temperatures in the range of 10-14 degrees Celsius. I started the run slowly. Within the first kilometer we get a bridge with some incline. I did fine during the incline but during the decline, I felt some discomfort in my knee. At around 14-16 kilometers I started to get terrible knee pain. I continued running but after 22 kilometers I had to slow down. Between 25 and 35 kilometers I jogged. After 35 kilometers I was unable to jog as my knee would get locked. I started walking. But that wasn’t easy either. I started to get cramps in my shoulder, stomach and calves while walking. At every point during the run I felt there were at least 1000 runners ahead of me and 1000 behind me. The last seven kilometres of the marathon felt never-ending. I have not walked at any run since 2011. I finished NYC Marathon in 4:03:51 hours, way outside my personal best of 2:53 hours. I will definitely go back to run the New York City Marathon. It is a very well organized race, the course is beautiful and markings were accurate with the blue line laid out all through the course. Hydration and refreshment support during the run was excellent. Cheering was also good. My priority now is to recover and heal. I require surgery to correct the knee issue. Next on the cards are 2019 Mumbai Marathon and the 2019 Boston Marathon. I won’t be able to run Mumbai Marathon. This is my fourth world marathon major. I have completed Berlin, Chicago and London so far. At New York City Marathon, on the morning of the run it was quite cold. Then it turned warm before reverting to cold. That’s typical New York weather. I had lived in New York for some time so I was aware of how the weather behaves. The run started well. I was doing good pace. I wanted to run fast in the beginning when my energy levels are good. At 25 kilolmeters I started to feel hungry and looked for food at support stations. I managed to get a banana but I had to stop to eat it, so I lost some time. I also lost some time at a couple of other water stations. The course, also, is a little tough. I finished in 4:11:50 hours, a personal best. Though I could have finished in better timing I am happy with the run. My training was brief; for about five weeks but still quite good. In September 2018, I had participated in the World Masters Athletics Championship in Spain. I came back on September 17 and started my training for NYC Marathon. Because of this marathon I had to give IDBI Half Marathon and the Airtel Delhi Half Marathon a miss. I started running in 2013. My first event was Pinkathon (10 kilometers) held in December 2013. Going forward I will be doing the half marathon at Vasai Virar Mayor’s Marathon and Mumbai Marathon. I am likely to run Tokyo Marathon in February 2019 and Boston Marathon in April 2019. 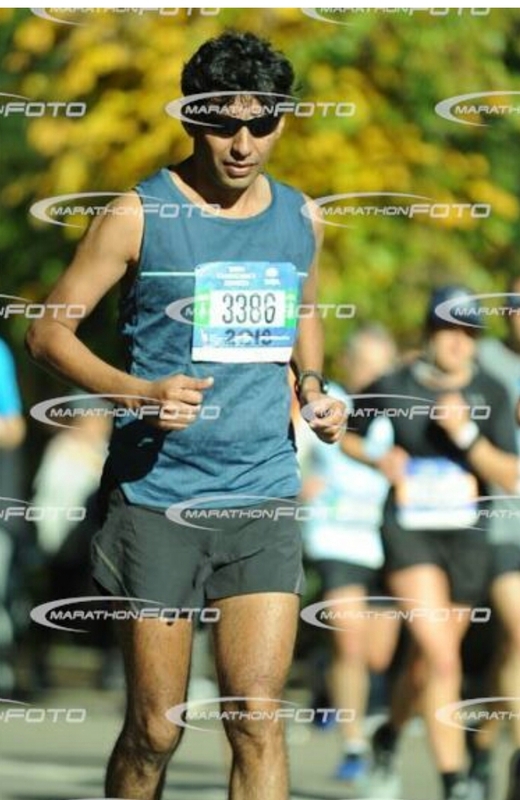 Just a week before New York City Marathon, I ran a 10 kilometer-race in Philadelphia. I ran well finishing the race in 46 minutes and ended up with a place on the podium in the senior category. But it was very cold with temperatures around 3 degrees Celsius with winds at 20 miles per hour accompanied with rains. I picked up a cold and a bad cough and chest congestion. A week prior to that, I had also suffered a fall in the bathroom hurting my spine and resulting in a stiff back. Therefore, at NYC Marathon, I had no specific time target. I just wanted to finish the run in sub-4 hours. I ended the run with a timing of 3:55:33 hours. I am happy with my timing. My personal best is 3:24 hours. I have also finished Boston Marathon twice with timings of 3:36 and 3:37 hours. My training for NYC Marathon was not quite up to the mark. I was not able to focus on speed. Instead, I focused on endurance. My training was aimed at completing the run. It was not centered around pace. Just a day before the marathon, I did a quick five kilometer-run to verify my capability and finished it with a pace of five minutes, five seconds per kilometer. I was, therefore, confident of a sub-four finish. NYC Marathon is an amazing event. The whole city celebrates and Manhattan is shut down. The entire running route is taken over by police. It is like being part of a mini universe as New York is akin to a mini universe. The entire route is jam packed with people cheering, singing, dancing and encouraging runners. There are bands playing all along the way and there was loud music as well. The bridges are the only places where there were no people as they are not allowed there. There are about five bridges in all on the route. You feel so happy and energized running in this city. NYC Marathon has the best cheering spectators among the world marathon majors. It is also the toughest among the six majors, I think. You never know what is coming your way as you progress along the route here. The bridges have gentle inclines and gentle declines and that can be quite deceiving. It is an extremely well-organized event and you just flow with the crowd. There are signboards, markers, hundreds of volunteers and police personnel. I feel it is much better organized compared with Boston Marathon. At NYC Marathon, there are different types of runners because the entry is lottery-based. I totally forgot myself because of the cheering and the enthusiasm of the volunteers. I have done Boston Marathon twice and now NYC Marathon. In 2019, I hope to do Berlin Marathon and Chicago Marathon back to back. I may end this year with one more marathon locally. I don’t train specifically for an event. My training is uniform throughout the year. On an average I log about 105-110 kilometers per week. I marvel at the sheer logistics of how New York City manages such a huge running event. New York City Marathon had over 52,000 runners. Yet it was organised so well. Pre-race day events and race day events were superb. 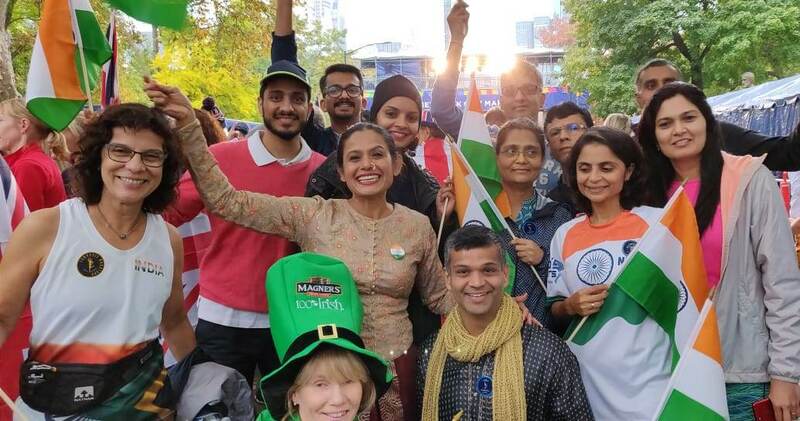 I excitedly participated in the pre-race country wise parade and was so proud to walk with the Indian flag. I met many other runners from India and Indians living abroad who were running this race. I had done Chicago Marathon three weeks earlier and had come back to India before leaving again for New York. I had little time to shrug off jet lag and body ache and be in good form for New York. The race day in New York was beautiful. It was cold in the beginning but the sun was up and there was clear blue sky. My coach and I had decided to go for 4:10 finish time and at the expo I had picked up a pace plan accordingly. I was very apprehensive about the route because it is undulating terrain and there were many flyovers. I started my race with extra layers and shed them when I had warmed enough. I ran sensibly till the half way mark because I was advised at the expo that the second half is tougher than the first. The last 200 meters was also a climb and Central Park was one undulating route. But I stayed true to the pace plan and finished in 4:09:32 hours. I am very happy with my timing. I have just one marathon major – Tokyo, left. I would love to finish it in 2019. Going ahead, my to do list includes full Ironman and Masters. I had run Berlin Marathon seven weeks before New York City Marathon. I ran in a saree, becoming the fastest woman to do so. My original plan was to come back from the German city and take two weeks to recover before I commence training for NYC Marathon. But that was not to be. After I landed in Mumbai, I was flooded with requests for interviews, both by print and broadcast media, for my feat: running in a saree at Berlin. I also got invitations for felicitation functions, many of which I had to turn down. During one such interview, I had to wear my nauvari saree (traditional Maharashtrian saree) and do a short run for a video shoot. But I tripped and fell, badly bruising my knee. My injury was quite bad and that put a stop to my training. The doctor, I went to, said the injury would take six weeks to heal. I was on antibiotics to help the healing of the wound. Two weeks before NYC Marathon, I also got flu. With all these, I just resorted to slow jogs as part of my training. During my travel to New York, I had stomach distress on the flight. I had to miss the pre-race day parade. On race day, I woke up at 3 AM. Getting to the race venue was an experience. There were thousands of people on the roads from early morning. Everywhere, there were queues – for buses that transport you to start line, queues at toilets. I started the run slowly as my aim was just to finish the marathon. NYC Marathon is like a river of people – hundreds of runners and thousands of spectators cheering you. Despite my stomach issue, I did not feel tired. I did not get any cramps either. I finished the run in 3:56:29 hours. I guess running the Berlin marathon was my training for NYC Marathon. I will be doing Chicago Marathon in October of 2019. In the following year, I hope to do Tokyo Marathon and London Marathon.